This tour is designed as a leisurely, in depth experience with two or three nights at most hotels. 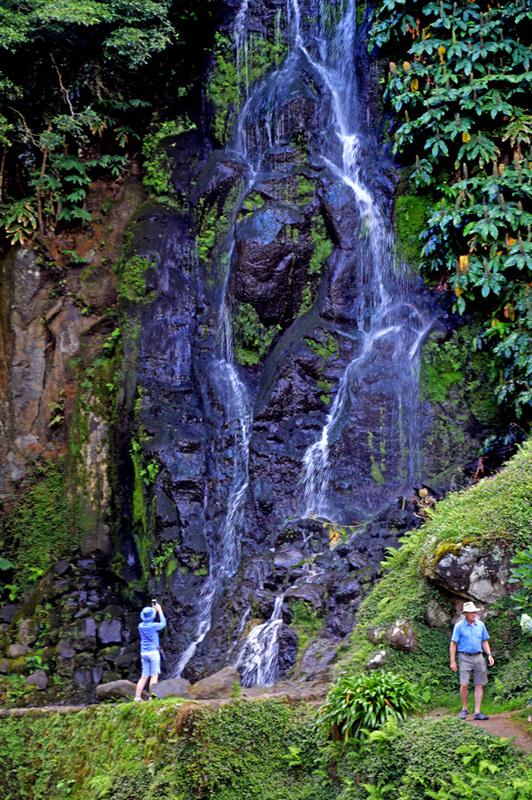 The journey includes extensive touring through the islands which are very hilly. There will be opportunities for longer walks but these are optional for those interested. A number of walks are included which will involve hills, cobblestones and some steps. The islands themselves are quite hilly and this may affect those with limited mobility. All members need to be physically fit and able to meet our basic criteria to fully enjoy this journey. The archipelago of the Azores is made up of nine islands spread across a region in the Mid Atlantic, between America and Europe. Since their discovery in the 14th century, the Azores have played an important role as a staging and victualling point for ships crossing the Atlantic, an enviable location for nations with New World colonies. Today the Azores are an autonomous region of Portugal, characterised by dramatic landscapes, quaint fishing villages, centuries old farms, green pastures and hedgerows of blue hydrangeas. The countryside is little changed from centuries ago and the farms, villages, churches and monasteries transport us back in time. Green, volcanic and remote, the islands provide an opportunity to experience a bygone era, to slow down and to enjoy the tranquil beauty of the islands. 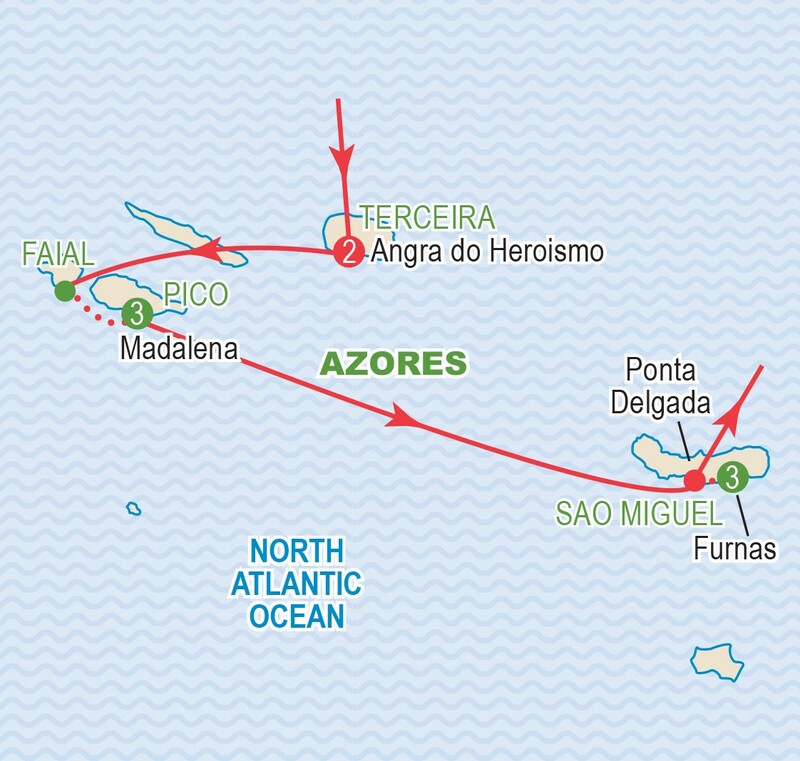 Come with us as we explore four of the islands: Terceira, Faial, Pico and São Miguel. Each has its own history and its own beauty. We shall see and feel all that these islands have to offer from their historic centres to their smallest farmsteads, from the beautiful seascapes to the active volcanoes and everything in between. Be sure to book early as this will be a small group and we have limited space available. Group members from across Canada gather in Toronto for the SATA Airlines flight to Terceira island. Early this morning we arrive on Terceira island, which translates as the “Third”, the third island discovered and the third largest. On arrival we will meet our local guide and transfer to Angra do Heroísmo, a UNESCO World Heritage Site and a delightful city where we step back in time an era long past. Its snug harbour is protected by a volcanic cone which made Angra a major staging point during the 16th to 18th centuries, for ships bringing the wealth of the New World colonies to Europe. Enjoy a walk to the Public Gardens and the former Jesuit Convent which, since 1776, has been the Residence of the Governor. Nearby we find the 16th century Cathedral, the baroque Palace of Bettencourt and the Convent of São Gonçalo, dating from 1542. Enjoy the afternoon at leisure and our Welcome Dinner at our hotel this evening. Drive to Monte Brasil for commanding views over the whole island, and stop at Pico das Cruzinhas Belvedere for the most impressive view over Angra do Heroísmo. In the centre of the island we visit Algar do Carvão, an ancient lava tub that reaches 100m deep and which is full of interesting geology. On the east coast, enjoy views of typical settlements and traditional houses that contrast with the lush green fields encircled by lava stonewalls. One of the oldest on the islands, the parish church in São Sebastião contains beautiful antique frescoes. Nearby is an “Império”, a small chapel characteristic of the Azorean towns. Império are central to the religious festivals of the Holy Ghost popular throughout the Azores. Such medieval festivals are now seldom seen in mainland Europe. After lunch in a typical local restaurant, we drive to Praia da Vitória and on to Serra do Cume, enjoying the scenery overlooking Lajes and the ocean. Passing the area of wild bulls used in the bullfights of Terceira (Touradas), we come to Biscoitos to see the natural lava swimming pools and to visit a local winery. Pico is dominated by Mount Pico, the highest peak in the Azores. Islanders make good use of the black volcanic rock to build their houses and the walls that protect their fields. This morning enjoy our walk in the village of Madalena. 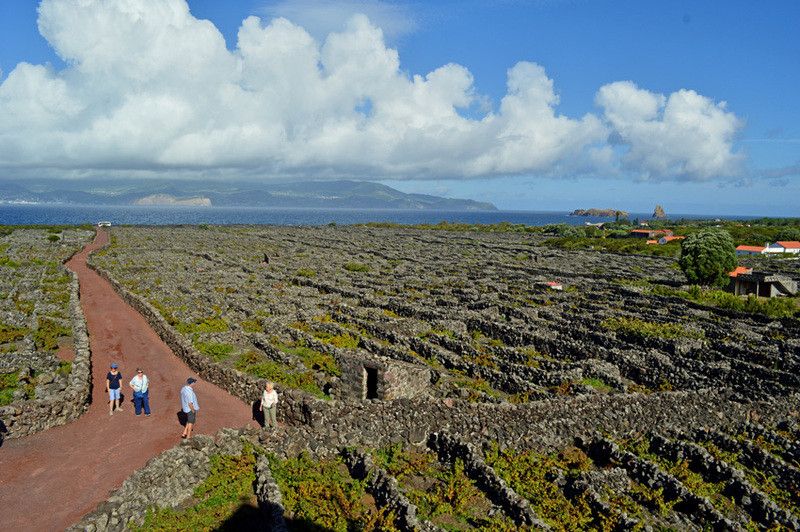 On the West side of the island we visit the vineyards of the Criação Velha, with a walk by the vineyard landscape of the Pico Island. 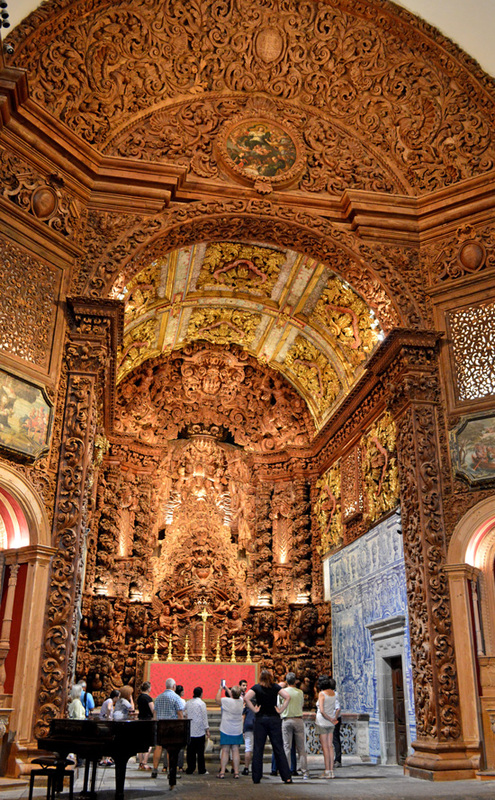 We follow the South side of the island, stopping at the Sanctuary of Bom Jesus in São Mateus. In Lajes do Pico, pioneer village and the oldest of the island of Pico, we visit the Whaling Museum. On the way back to the hotel, we return to the central plateau and stop at Lagoa do Capitão. Drive with our guide to the north side of the island to the protected area of the Vineyard Culture Landscape and visit the interpretation centre. Visit the village of São Roque where we stop for lunch. After we will continue to Prainha with a short stop at Mistério da Prainha and on to Santo Amaro where we visit the School of Crafts. On our way back, we will go up to the Central Plateau to visit the remaining lakes. Our morning is dedicated to exploring Nordeste, a beautiful coastal village, noted for its lush vegetation, delightful gardens and waterfalls. Highlights will include Salto do Cavalo, Ribeira dos Caldeirões and the village of Nordeste. Enjoy the dramatic views from a variety of noted belvedere (literally “beautiful view”) for which this coast is justly famous: Ponta do Sossego, Ponta da Madrugada and Ponta do Sol. After visiting Povoação, we return to our hotel with free time for lunch. This afternoon provides us with a number of options. 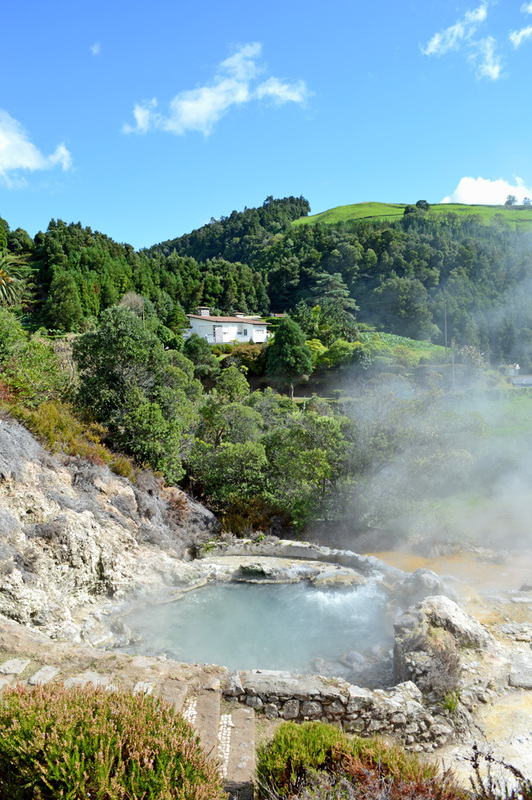 A highlight will be the hike around Furnas Lake located at the heart of an extinct caldeira (volcano). The full walk is about 9 km on level well groomed trails but travellers can do as much or as little as they like. In the walk you will have the option to visit the Hermitage of Nossa Senhora das Vitórias, a small but exquisite Gothic chapel built in the 19th century. Travellers can also opt to relax by the lake, to enjoy the gardens by our resort or to use the thermal pools for which our resort is famous (everyone will be able to use the thermal pools). Relax over dinner, back at our resort. 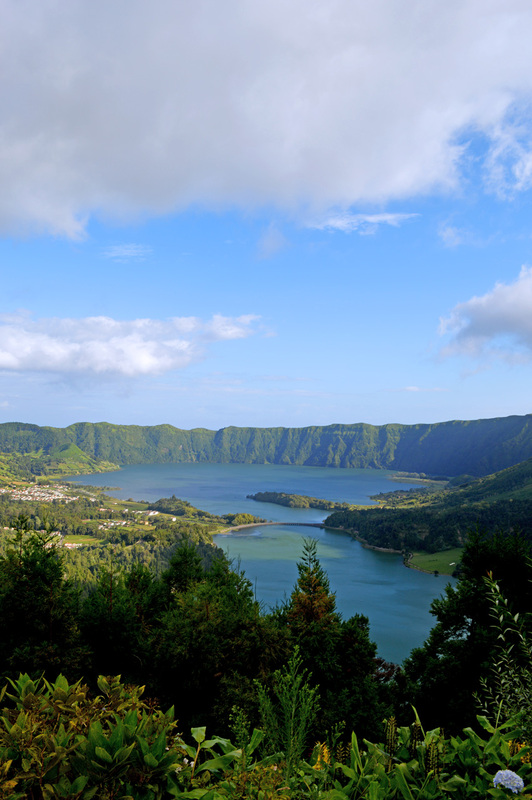 Drive into the mountains to overlook Lagoa do Fogo, a volcanic lake noted for its tranquil setting and beautiful landscapes. 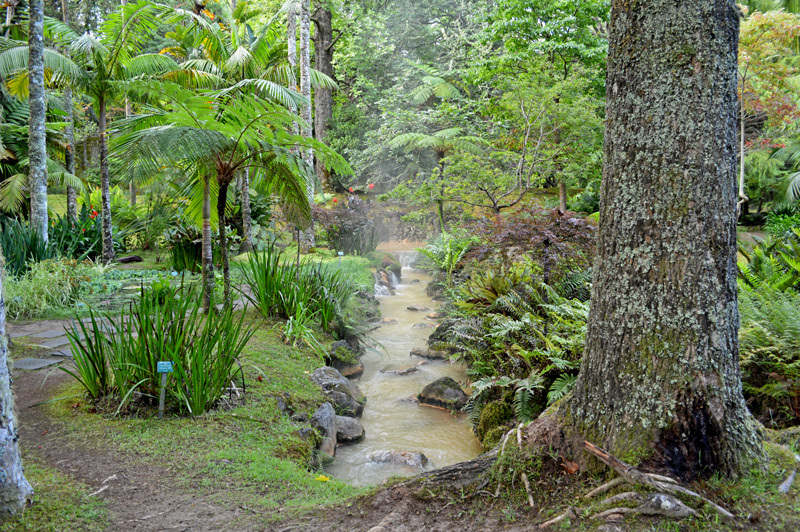 En route, stop at Caldeira Velha with an opportunity to enjoy the soothing hot springs. After lunch on our own in Ribeira Grande, city noted for its 17th and 18th century baroque architecture, we drive to the north side for wonderful views along the coast. Visit the tea plantations of Gorreana to see the terraced tea bushes, the only such to grow in Europe before returning to our resort with free time in the late afternoon. This evening we gather for our Farewell Dinner. Ponta Delgada is the largest city as well as the capital of the Azores. Urban sprawl is beginning to set in but the historic centre of the city is still very charming. Returning to the city this morning, we set out on foot, for an exploration of this city, beginning at the Portas da Cidade or city gates before continuing to the city hall, the jeweled statue of S. Miguel Arcanjo (Island’s Patron Saint), Matriz Church, Museum of Sacred Art, and the old Convent of Jesuitas. Finally we will visit the convent da Esperança and the statue in the Sanctuary Santo Cristo dos Milagres. There will be free time for lunch before we transfer to the airport to catch our direct flight back to Toronto, with connections to our homes across Canada. Prices are based on a minimum 20 members and on rates, taxes and fees effective December 2018. Prices are subject to change due to factors beyond our control. Group to be escorted with a minimum of 20 travellers. *Land Only price does not include the cost of any internal flights in the Azores (these will be quoted, subject to confirmation). Airfares from other gateways are available on request. Airfares and air carriers are subject to change and will be confirmed prior to final payment. Refer to inclusive features for details. Prices DO NOT INCLUDE the cost of insurance which is available and is highly recommended. Premiums vary with the cost, length of the trip, and the traveller’s age. For passengers up to and including 74 years on departure date, premiums will range from $211 to $314 pp plus applicable taxes. Cost supplements for travellers aged 75-85 will range from $177 to $355 pp plus applicable taxes. This insurance is effective from the date of purchase and carries limitations on pre-existing medical conditions. Please discuss your insurance coverage prior to booking. Refer to our Terms and Conditions for more information.